This May has been marked by very warm weather over Alaska, while in a band from Greenland to Siberia cold anomalies have dominated. Western Eurasia and the Barents Sea have been experiencing warmer temperatures than average. Click on the image to enlarge and view the scale. Under this warmth the Beaufort Sea has retreated, taking advantage of early season open water formed by winds off Banks Island. May average extent is the second lowest on record. However this fast early retreat may not proceed so fast in the weeks to come. HYCOM shows that the melt front is hitting thicker ice, and this might cause a slower rate of losses in the weeks to come. The following is a detail from this image from the US Navy's HYCOM-Cice model. 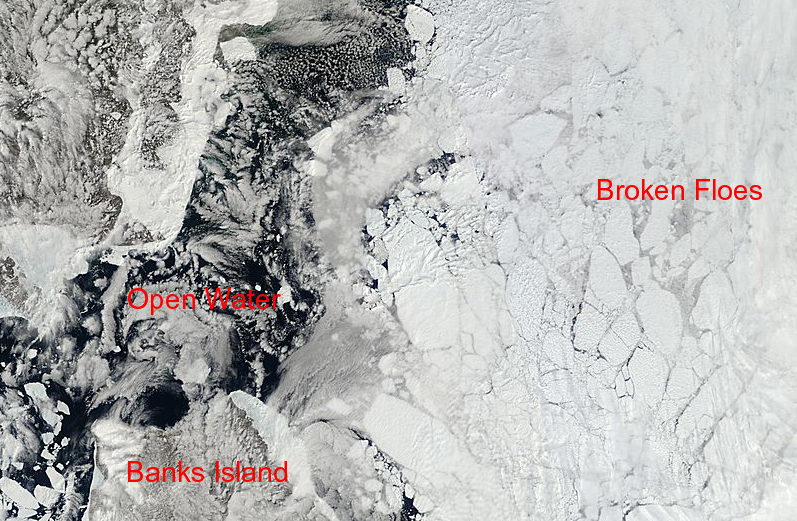 That issue regards thicker ice noted, the thick ice shown above is seen in MODIS as broken ice floes with open water between them. This state of the ice floes is not unusual however, and in my opinion it does not guarantee they will melt out quickly. 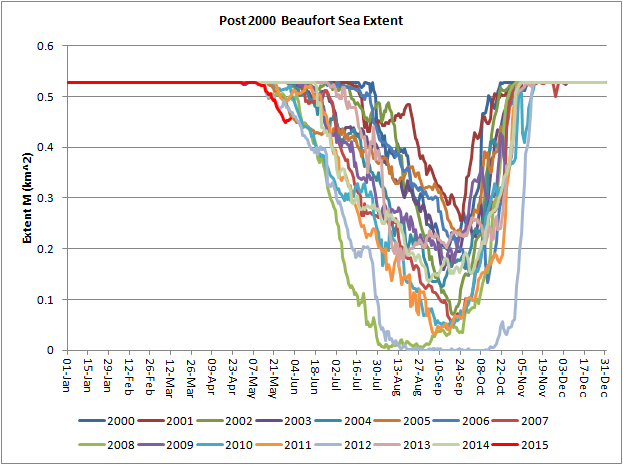 But it does suggest that even if we see a slow down in Beaufort, it is not necessarily game over for the rest of the season. As will be seen, the cold over the Siberian coast is having an impact on the ice along that coast, while winds are playing a very strong role in May throughout most of the northern hemisphere ice. The winds are driven by pressure differences, and May shows four dipoles that play pivotal roles. 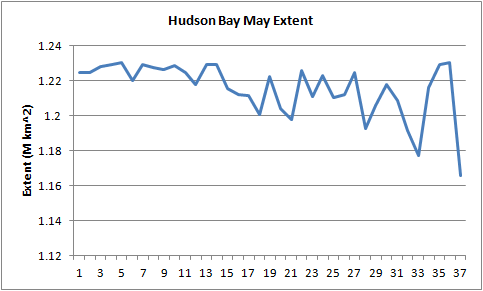 For completeness here is May sea level pressure (SLP). An annotated version of that will follow, but again merely for completeness, here is the vector wind, details are visible if you click on the image. So here are the four dipoles dominating events in the sea ice in May. High pressure is in greens and yellows, circulation of winds is clockwise around a high pressure in the northern hemisphere. Low pressure is in blues and purples, circulation is anti-clockwise around a low pressure in the northern hemisphere. Where a high and low meet there is a dipole flow, with winds driven between the two pressure systems. This is a common atmospheric configuration, but seems to me to be having quite a remarkable impact over May. So what have these four dipoles been doing over May? 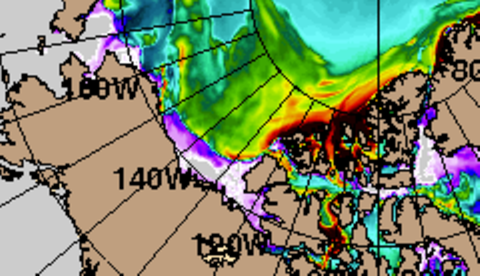 This dipole impacts the Bering Sea and Chukchi Sea. 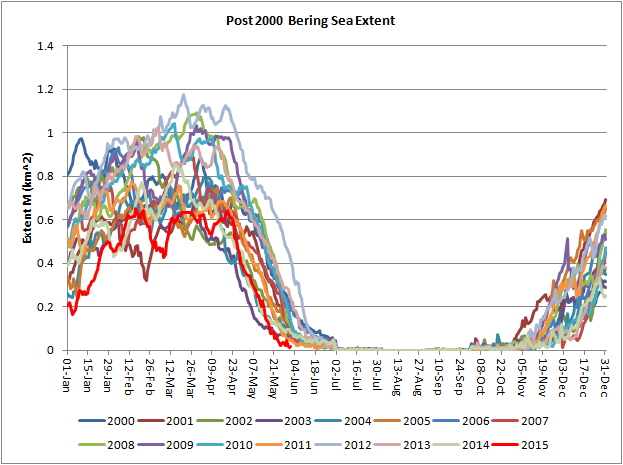 After a winter with very low sea ice extent in the Bering Sea May finished with the lowest extent on record on 30 May, and the May average extent was the second lowest on record (since 1979). 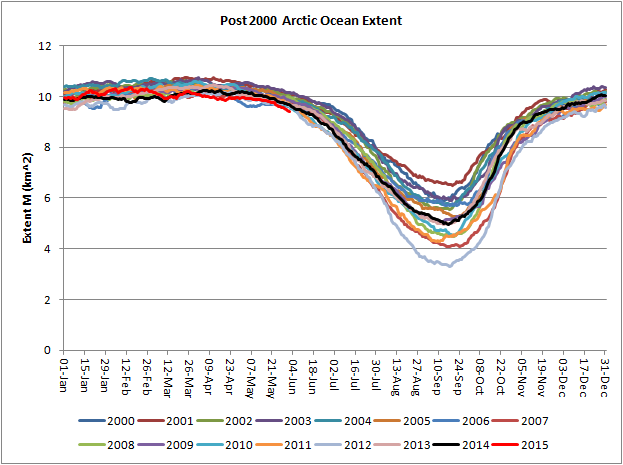 This dipole may also be drawing in Pacific water into the Arctic. 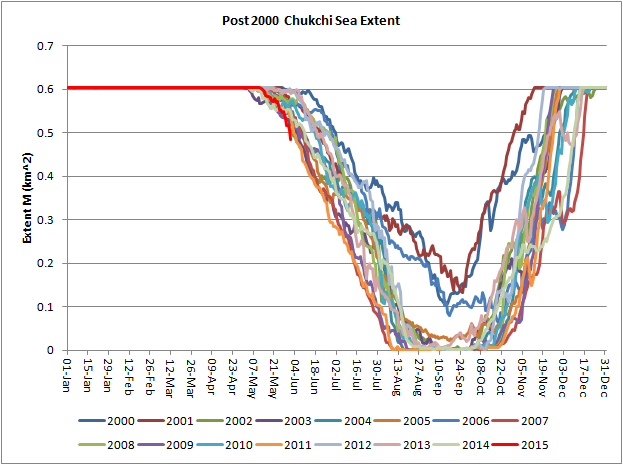 Chukchi Sea has been under atmospheric warmth from Alaska, but the ice state there through May has been poor. 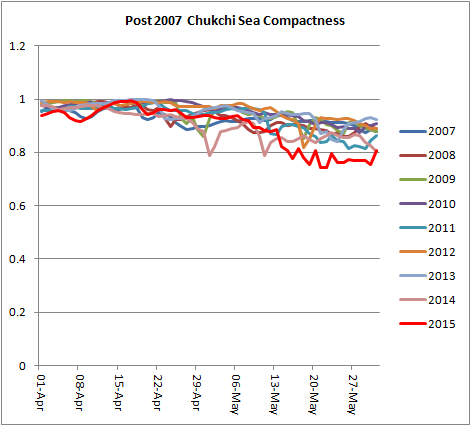 As of the end of May Chukchi is at its lowest extent on record. However, this does not seem to me to be a matter of wind driven movement of ice, which should make the ice cover compact. Rather there seems to be a more dispersed pack in Chukchi. Compactness is defined as Area/Extent, the further below 1 that compactness is the more dispersed the ice. Compactness has risen in the last few days, this may be due to convergence of the ice under a high pressure currently in place over the eastern Arctic Ocean. During May average compactness has been the lowest since 1979 at 0.83. This means a more dispersed pack in the lead up to the solstice in late June with the possibility of strong ice/ocean albedo feedback. This dipole has driven air from the Arctic Ocean ice pack over Siberia, keeping temperatures low over both the pack and the adjacent land. Extent in the East Siberian Sea. This has had the effect of retarding the sort of melt that would be typical of recent years. 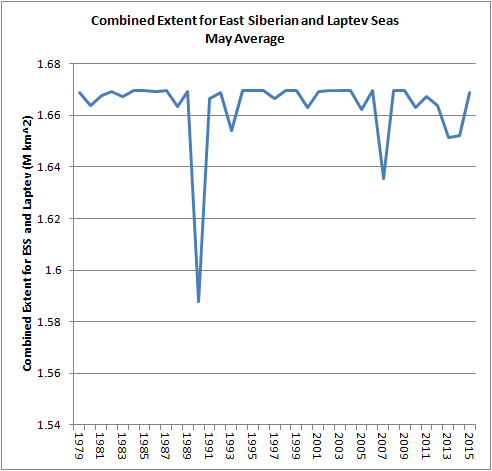 Combined extent for the East Siberian and Laptev Seas is currently remains near the winter peak extent, indicating little open water formation. 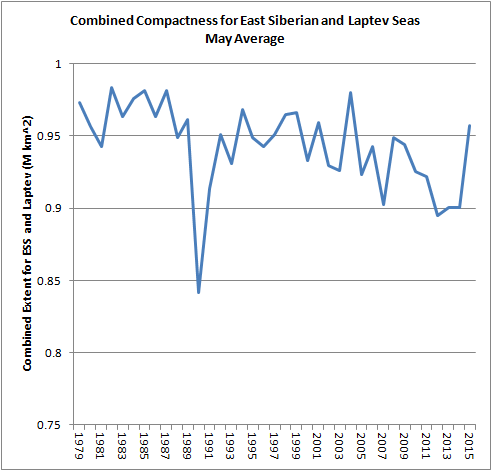 And combined compactness for the East Siberian and Laptev Seas is high in the context of recent years. What effect this will have on the season to come, I am not sure. It is quite possible that with good melt weather this slow start can be overcome. Dipole 3 has drawn warm air in off the continental land over the Barents Sea and has compounded the decline that started there in February. 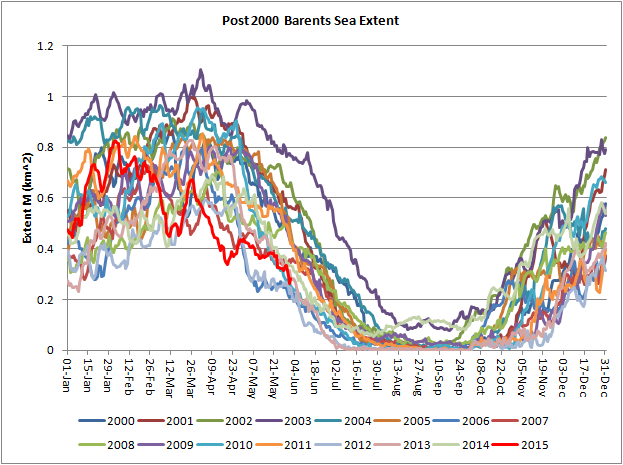 Barents Sea May extent is the third lowest since 1979, and is part of the long term decline of sea ice in this region. Dipole 4 is formed by the low over Baffin Bay and the general high tendency over eastern Canada. 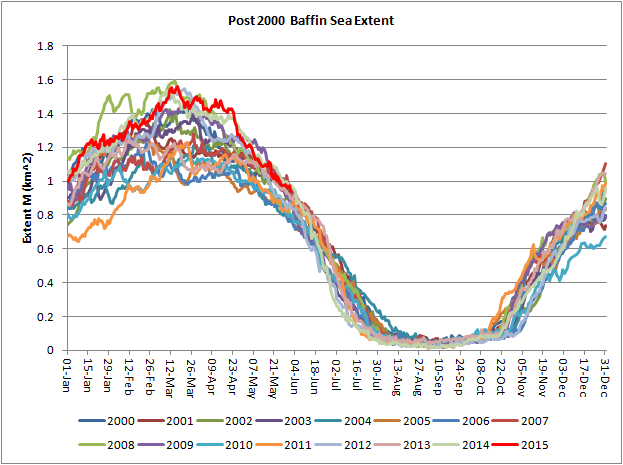 Conditions in Baffin Bay have led to high extent through May. 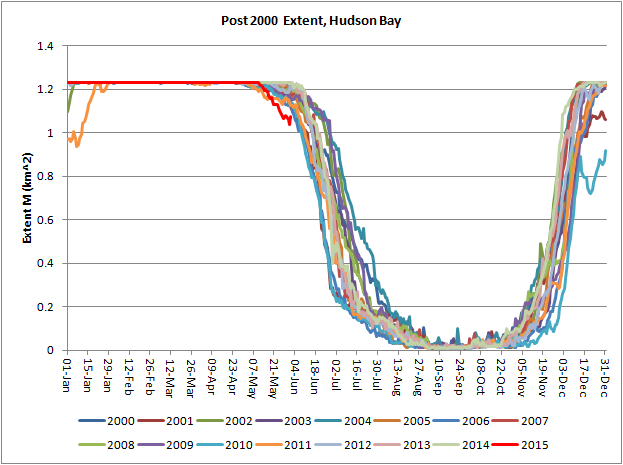 Hudson Bay May extent is the lowest on record, as can be also appreciated from the plot below. What is even more striking is the start of melt. 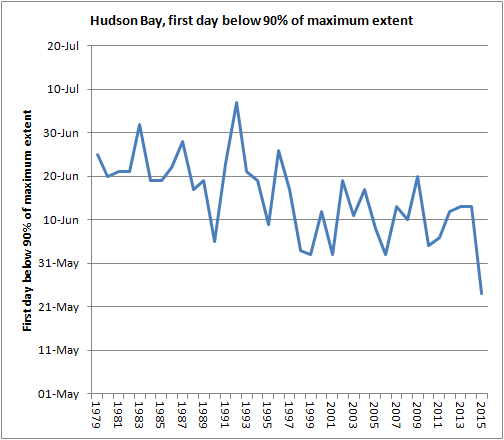 Here I have used the 90% below maximum winter extent level as a definition of the start of the melt season proper in Hudson Bay, the following graphic shows the timeseries of first day at which extent is 90% below the maximum. Whilst there is a general downward trend, this year has seen a highly unusual early start to melt, combining the trend of the above, with the issue of wind this year, I view this as a combination of weather and anthropogenic global warming. Of course it means even less time on the winter ice for the Hudson Polar Bear population. So these are the four dipoles that have played such a role in producing the mixed picture at the start of the summer. Such a mixed picture is not exceptional. Using Data for the 30 May 2015 here is a plot showing the state across all regions. 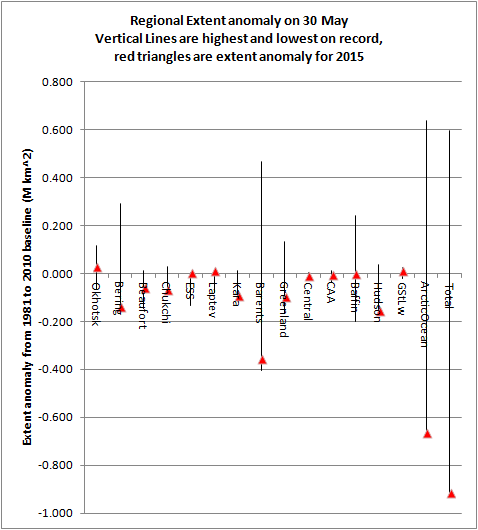 In that plot above the vertical lines show the range from highest to lowest for the individual regions for the 30 May from 1979 to 2015. The red triangles show where we are this year. The Arctic Ocean definition I use is: Beaufort, Chukchi, East Siberian Sea, Laptev, Kara, Barents, Greenland Sea, Central Arctic and the Canadian Arctic Archipelago. This is the region whose seas set the minimum extent. Due to the combination of factors outlined in this post the Arctic Ocean starts the summer with the lowest extent since 1979. I am not convinced that this means much, as the black line for 2014 suggests. In view of the length of this post, I have decided to post now. A second post covering May PIOMAS data will follow when that data is released. This is a little bit off topic but I thought it fitted nicely with your review of May's weather impact on the NH pole, I hope you'll forgive me. So you show a blob of cold over Greenland and it seems to be having an unusal effect on the ice sheet melt. The info is from the website above and the interesting graph I thought was the one I'll try to post next. It shows the % of the ice sheet thats experiencing melting. It would seem that typically around 10-20% of the surface should be experiencing melting but ATM its still down in the 2% region. From the grey shading in the graph it looks like this is well out of the range seen in previous years ( back to 1990). In short it looks like the present weather conditions have delayed melt on the Greenland icesheet by a month. That's very useful, Greenland is an issue I don't get round to following as often as I should. The main cause of the Global warming is excess temperature on the earth. Your valuable blog aware us from the side effect of increasing the temperature.